Go with the flow in this go-to tank. 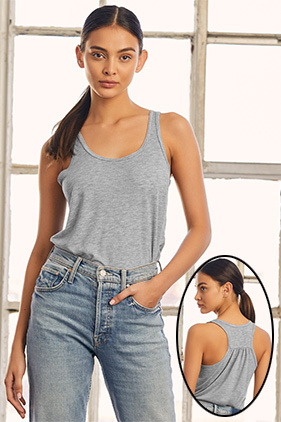 65% polyester/35% viscose, 32 single 3.7 ounce poly-viscose blend racerback tank. Sideseamed. Relaxed, flattering draped silhouette. Merrowed bottom hem. Round neck. Sheering at racerback seam. Marble Colors: 91% polyester/9% Airlume combed and ring-spun cotton, 30 single 4.0 ounce . Stripe Colors: 70% rayon/30% polyester, 30 single 3.7 ounce . Slub Colors: 50% polyester/37.5% Airlume combed and ring-spun cotton/12.5% rayon, 32 single 4.0 ounce . Black Slub: 40% polyester/30% Airlume combed and ring-spun cotton/30% rayon, 32 single 4.0 ounce .